From the ancient Indian teachings, we know that there are five physical elements of creation: Earth, air, fire, sky and water. Since we have access and far better understanding of technological advancement, every individual is duty-bound for the sustainable use of every single element for the survival of the upcoming generations. In 1993, the United Nations designated March 22 as World Water Day. The Sustainable Development Goals (SDGs), which were adopted in 2015, laid emphasis on water and sustainable use. India, which has one-sixth population of the world, is working sincerely in this direction. This year, the ministry of water resources, river development & Ganga rejuvenation is organising the four-day Fifth India Water Week, starting on October 10. According to the Food and Agriculture Organization, the daily drinking water requirement per person is two-four litres, but it takes 2,000 to 5,000 litres to produce a person’s daily food. It estimates by 2050, the world’s water will have to support agricultural systems, which will feed and create livelihoods for an additional 2.7 billion people. According to the Central Water Commission’s 2015 Water and Statistics Report, thanks to the increasing population, the national per capita annual availability of water is estimated to reduce from 1,608 cubic metre in 2010 to 1,139 cubic metre by 2050. For India, the need for developing and managing water resources assumes significance as the nation moves up the ladder of development. Currently, more than 50% of the India’s workforce is dependent on irrigation for agriculture. World over, the irrigation sector is the largest user of water. In India, the sector uses 85% of its available water resources, having a major share of groundwater. 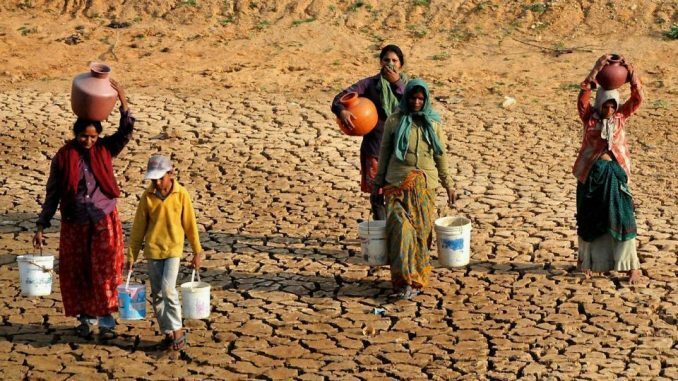 The erratic rainfall pattern is leading to drought-like situation in Bundelkhand, Vidarbha and parts of Rajasthan, Gujarat, Madhya Pradesh, Andhra Pradesh and Telangana. On the contrary, Assam, Arunachal Pradesh, Bihar, Chhattisgarh, Himachal Pradesh, Karnataka, Kerala, Maharashtra, Manipur, Mizoram, Nagaland, Odisha, Sikkim, Tripura, Uttarakhand and West Bengal have been affected by heavy rains/flash floods. This dichotomy demands serious and continuous efforts to manage our water resource with decentralised approach with the participation of states governments, panchayati raj institutions, community organisations and households and individuals. For the development of water resource and transferring water from water-surplus basins to water-deficit basins, the government has identified total 30 links, 16 under peninsular component and 14 under the Himalayan component under the National Perspective Plan. The Centre is pursuing the interlinking of rivers (ILR) programme in a consultative manner by taking it on high priority with the aim of transferring 170 billion cubic metres (BCM) of water from surplus to deficit areas, create an additional irrigation potential of approximately 35 million hectare, apart from the incidental benefits of flood moderation, navigation, drinking and industrial water supply, fisheries, salinity and pollution control etc. The central government is continuously coordinating with the states for the Ken-Betwa link, Damanganga-Pinjal Link, Par-Tapi-Narmada link and Mahanadi-Godavari link to bring them to a consensus for interlinking of rivers by persuasion and mutual agreements. For rational and balanced water management, the demand and the supply side of its distribution has been re-looked at. The positive results of investment on irrigation projects can be seen as compared to investment in other infrastructures such as roads, highways, railways, airports, which take time to show results. The Centre has launched the Pradhan Mantri Krishi Sinchayee Yojana (PMKSY) during 2015, which includes the Accelerated Irrigation Benefits Programme and components like per drop and more crop. The Drought Prone Area Programme has also been prioritised under the PMKSY. Building a platform for convergence of investments in irrigation through comprehensive district and the state irrigation plans, this scheme envisages an end-to-end solution in irrigation supply chain viz. water resources, distribution, efficient application and extension services. The focus is on improving water-use efficiency at farm level and bridging the gap between irrigation potential created and utilisation. To improve the extent, quality, and accessibility of water resources information, decision support system for floods and basin level resource assessment/planning and to strengthen the capacity of targeted water resources professionals and management institutions in India the government has approved the National Hydrology Project in 2016 as a central sector scheme and establishment of National Water Informatics Centre (NWIC) as a repository of nationwide water resources data.